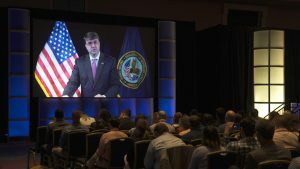 VA Secretary Robert Wilkie addressed the Student Veterans of America (SVA) National Conference last week via live stream from Washington, D.C. In his speech, Wilkie outlined his priorities and the role the Veterans Experience Office (VEO) plays in the department’s improvement. One way VEO has used feedback is by creating a helpful product called the VA Welcome Kit. The kit, which was designed with student Veterans in mind, was first introduced and tested at the SVA National Conference last year in San Antonio, Texas. This year, after refining the kit, VEO passed out hundreds of them before Wilkie’s speech. The Welcome Kit has guides and checklists to help Veterans apply for education benefits, VA health care, disability ratings, and caregiver benefits. The kit also includes a booklet explaining eligibility and VA processes. Additionally, it maps out the life of a Veteran from transition out of the military to retirement and care. Veterans can use this map to find out where they are in the VA system. Click on the carousel below to view sample pages of the Welcome Kit. The post Secretary Wilkie talks Veterans experience, welcome kit appeared first on VAntage Point.